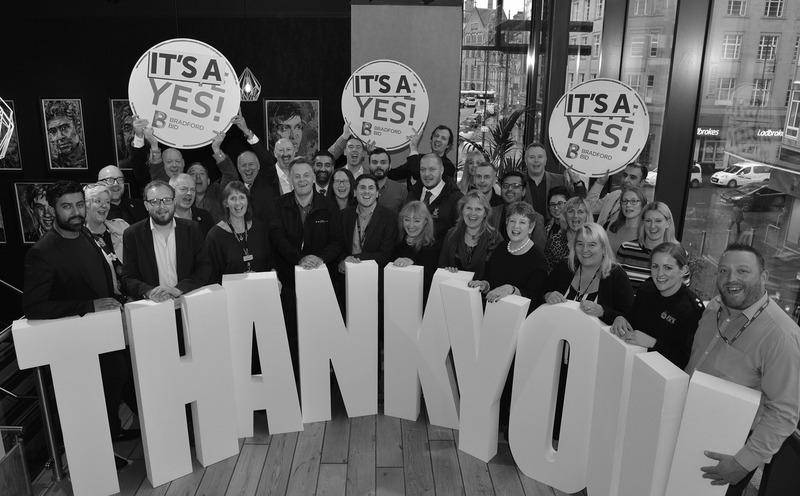 A Business Improvement District (BID) is to be launched in Bradford after city centre businesses gave it a massive ‘yes’ vote after a month-long postal ballot. More than 630 businesses were asked to vote on setting up the BID, which plans to raise £2.5 million to spend on projects to boost the city centre over the next five years. In all, 79 per cent of those who took part in the ballot voted in favour. The vote represented 85 per cent of the total rateable value of the properties owned and managed by those who voted. Under the BID regulations, more than 50 per cent of those who take part in the ballot, representing more than 50 per cent of the total rateable value, need to support the scheme for it to go ahead. The BID team will now start the process of establishing it as a legal entity, a company limited by guarantee. It will take about a month to establish the operating board, appoint a BID manager and set up an office and then its work will begin in earnest in the new year. It expects to collect about £2.5 million over five years through a levy on businesses with a rateable value (RV) of more than £12,000. A small business valued at £15,000 will pay just £3.61 a week and a business with an RV of £65,000 will pay £15.63 weekly.During its five-year term, it will work on improving the cleanliness and general appearance of the city centre, help to ensure it feels safe and inviting, organise and support new attractions and events, market and promote the city to local, regional and national audiences and provide a voice for businesses to lobby for more investment. Bradford Civic Society has been represented on the BID development board since it first met in January 2017 alongside organisations such as the National Science and Media Museum, Bradford Breakthrough, Bradford Chamber of Commerce, Freemans Grattan, Napoleon’s Casino, Schofield Sweeney, Gordons LLP, Sunbridge Wells, Exa Networks, Marios hairdressers and Little Germany Action, among others.